Space elevators have long been a staple of science fiction. Now, scientists in Japan will test space-elevator tech from the International Space Station. The push for a space elevator took a step forward this week when a team of researchers from Shizuoka University in Japan announced that they will launch an experiment to the International Space Station next week. In the experiment, which will be the first of its kind in space, two ultrasmall cubic satellites, or "cubesats," will be released into space from the station. They will be connected by a steel cable, where a small container — acting like an elevator car — will move along the cable using its own motor. A camera attached to the satellites will record the movements of the container in space, according to the Japanese newspaper The Mainichi. The materials for the experiment, which was developed by researchers at the Shizuoka University Faculty of Engineering, will launch to the space station Monday (Sept. 10) on the Japan Aerospace Exploration Agency's next Kounotori cargo ship, H-IIB Vehicle No. 7. It is scheduled to launch from the Tanegashima Space Center in Japan's Kagoshima prefecture at 6:32 p.m. EDT (2232 GMT) on Monday, though it will be early Tuesday morning (Sept. 11) local time at the launch site. 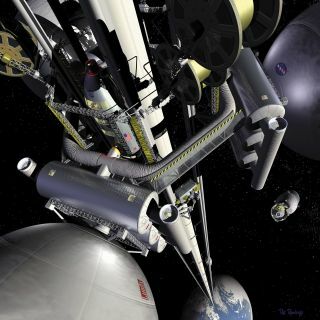 Engineers have been dreaming of a space elevator for decades. In 2012, Tokyo-based Obayashi Corp. announced plans to build a space elevator by 2050. The concept has also caught the attention of Google X, Google's division for big ideas, in the past, as well as an X Prize competition. The China Academy of Launch Vehicle Technology, a division of the China Aerospace Science and Technology Corp., also announced last year that it plans to have an operational space-elevator system by 2045. While experiments to extend a cable in space have been conducted before, the new Japanese experiment will be the first test to move a car-like container on a cable in space. If the experiment is successful, it could significantly boost interest in the space-elevator transportation system, a concept that many people still doubt is plausible. Although the space-elevator concept was once thought to be the stuff of science fiction, some aerospace engineers believe the idea is essential to the future of space exploration as an alternative to building ever-larger rockets;in terms of payload, rocket power has more or less reached its limitations. The cost of moving people and materials into Earth orbit would be dramatically reduced, thus enabling the construction of larger space stations and a lunar base, and even helping to serve as a starting point for a crewed Mars mission, space-elevator advocates have said. "In theory, a space elevator is highly plausible," Yoji Ishikawa, leader of the new experiment's research team, told The Mainichi. "Space travel may become something popular in the future." Obayashi Corp. estimates the total cost of a fully functional, first-generation space elevator to be 10 trillion yen (about $90 billion) — almost the same as that for the maglev train project connecting Tokyo and Osaka. The Shizuoka University team's space-elevator experiment comes on the heels of the International Space Elevator Consortium's (ISEC) 2018 Space Elevator Conference in Seattle last month, where dedicated scientists, engineers and invited speakers gathered to discuss the latest developments, share new ideas and scrutinize new concepts for the novel space technology..